Michael Rainer is managing partner and founding member of GRP Rainer LLP. A main focus of his work is the legal consultation on international investments and projects across Europe and Asia. He is broadly experienced in negotiating proceedings and in strategic planning. He studied law at the University of Bonn and received his law degree in 1999. 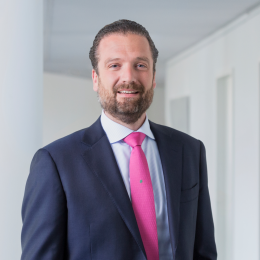 He completed a legal traineeship at the Cologne District Court until 2003 with stages at MTU Hannover (Aero Engines) in the field of Mergers & Acquisitions. He also gained experiences as a consultant on trade contracts for a medium-sized mechanical engineering company. After the second state exam he got admitted to the German bar in 2003. GRP Rainer LLP is an international law firm with lawyers and tax advisors specializing in business law, commercial law and company law. The attorneys counsel commercial and industrial companies and corporations, as well as associations, small- and mid-sized businesses and private individuals worldwide from offices in Cologne, Berlin, Bonn, Düsseldorf, Frankfurt, Hamburg, Munich, Stuttgart, Germany and London UK. Knowledgeable and experienced. Responding to the clients’ needs with personalized service is the priority at GRP Rainer LLP, and clients can rely on GRP Rainer's guarantee of complete integrity and commitment to their interests at all times. GRP Rainer is dedicated to working toward the clients success. Reliable and determined. GRP Rainer LLP provides the comprehensive knowledge necessary to compete in today’s ever-changing and expanding global markets - legal advice and tax advice. In order to gain a key competitive advantage, it is imperative to receive outstanding, well-rounded interdisciplinary advice based on analyzing and optimizing available legal, fiscal and economic opportunities. Proactive and multi-faceted. The firm takes pride in being a client-oriented service provider. Their clients’ best interests determine every move. With their dedication to reliable, individualized advice they develop customized interdisciplinary and comprehensive solutions. GRP Rainer has access to a complete range of integrated and comprehensive consulting expertise at its fingertips, from tax advice to legal advice and management consultancy. GRP Rainer is therefore able to offer rock-solid and well-balanced success-oriented solutions to national and international companies regardless of their size, legal form, industry sector or complexity of issues. The firm carefully considers all business aspects on the basis of its outstanding specialized knowledge and extensive experience.